During the Turkish parliamentary elections on 24 June 2018, the Assyrian politician Tuma Çelik was voted into office and became a member of parliament. 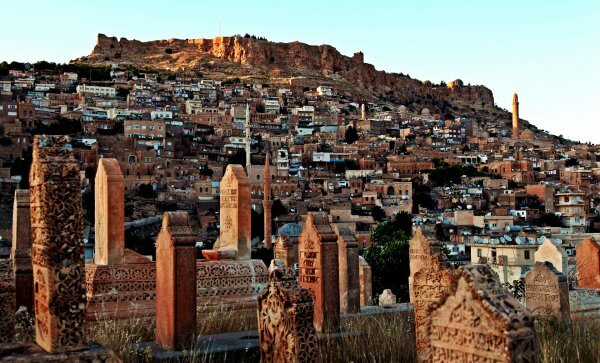 The politician of the Peoples’ Democratic Party (HDP) had run for office in the province of Mardin, where his party won 59,65 percent of the votes. During his election campaign, Çelik had stressed the efforts he wants to make for the demands of the Assyrian people. Concerning this matter, his objectives include the promotion of his people’s mother tongue, Aramaic, and the demand for respecting the integrity of religious lands of the Syrian Orthodox Church. The article below was published by Ahval News. As Turkey heads to presidential and parliamentary elections on June 24 , one party has stood out for the diversity of its candidates. The Peoples’ Democratic Party (HDP), is known for its deep links to the Kurdish political movement, but the presence of figures like Tuma Çelik, the Assyrian candidate for the southeast city of Mardin, shows the party’s aim of representing other minority groups. Assyrians are among the region’s most ancient ethnicities, with a history in Anatolia going back thousands of years. Despite this, they have been virtually invisible on the Turkish Republic’s political stage. Erol Dora was the first Assyrian parliamentarian to discuss his people’s issues after winning a seat on an independent ticket in the 2011 elections. Like other Christian communities in Turkey, the Assyrians should legally be classified as a minority group under the terms of the 1923 Treaty of Lausanne, which defined the concepts of minorities and minority rights in the newly founded Republic of Turkey. They did not, however, benefit from minority rights until a reform package in 2013. During World War One, Assyrians alongside Armenians were subjected to massacres and forced displacement, recognised by many – though not by Turkey – as genocide. This, and ongoing discrimination decades later drove many thousands to seek safety abroad. As a result, although there are only around 25,000 Assyrians left in Turkey, some 200,000 Assyrian Turks in the diaspora can cast votes in the elections. Their one expectation is that the party they vote for strives to create conditions that will one day allow them to return. Çelik, who moved to Switzerland aged nine, was one of those diaspora Assyrians. Now he has returned to Turkey determined to take the concerns of his people, in and outside Turkey, to parliament. While Çelik is grateful for the strides made by Dora in Turkish politics, he sees his own responsibility to the Assyrian community as an even greater commitment. Chief among these demands is to ensure a secure and democratic environment for Assyrians. These difficulties have only been exacerbated under the ongoing state of emergency, in place since the 2016 failed coup attempt, Çelik said. The conflict between Turkish armed forces and the Kurdistan Workers’ Party (PKK), which has been fighting since 1984 for self-rule in Turkey’s mainly Kurdish southeast, where the Assyrian population is mostly found. Many Assyrians have found themselves caught between the two sides. Besides the issues of security, Turkey’s Assyrians face issues related to their identity in a country that stridently promotes its official language, Turkish, at the expense of other native languages, including the Assyrian mother tongue, Aramaic. Religion is also an issue. Most Assyrians are Syriac Orthodox Christians. Turkey’s Islamist government has made efforts to seize lands belonging to the church, and in a country where 99 percent of the population is Muslim, it can be difficult for Assyrians to worship in peace. Çelik pledged to take both these matters up with the Turkish parliament as a matter of urgency, and aims to begin redressing what he says is the 90 years of injustice before Assyrian minority rights were recognised in 2013. With polls showing the HDP’s support steady, Çelik has every chance of winning a place in parliament in the elections. The politician believes his party can earn 14 percent in the parliamentary elections, partly due to an influx of votes from people keen to see the party pass Turkey’s 10 percent electoral threshold, which he says is the only way to defeat the ruling Justice and Development Party (AKP), that would otherwise likely take the seats as the second biggest party in the southeast. “The government is making efforts to prevent (the HDP from passing the threshold). In Mardin, for example, they took people who voted for us to the police station before our party’s visit and threatened them. People are going around the region with guns. They’re dressed in plain clothes and they’re scaring people,” said Çelik. As if to underline this point, President Recep Tayyip Erdoğan was caught on film this week instructing local AKP officials to identify and target HDP voters in their neighbourhoods; the day after this footage was revealed, four people were shot dead in a row between an AKP deputy’s relatives and a HDP-supporting shopkeeper.